This semester break, I spent 26 days in West Malaysia. Within the 26 days, 14 days were in Kuala Lumpur, my house; whereas the remaining 12 days were in Malacca, my hometown. Now I'm gonna show you what I've done to my Desktop at my home for 2 weeks. Surgeries were made just for the sake of beauty of my Desktop. 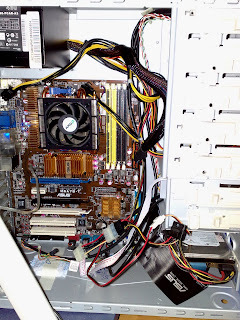 Firstly, the cable management, it took me hours to do, and it's my first time too! While doing the cable managements, I was dehydrating, sweats were flowing out rapidly. Then, added some bling bling stuffs and so on. 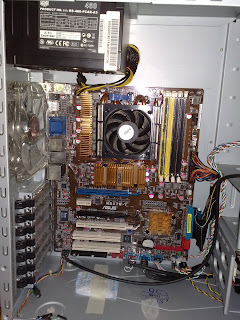 Before the main surgery began, this is how it looks like, ugly wasn't it? Doesn't it looks neater compared to the previous pictures? 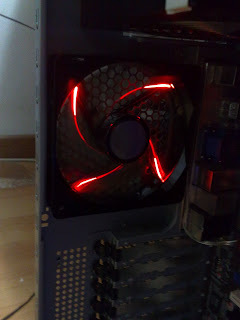 Added a pair of red CCFL and changed the back exhaust fan, from blue 1.2k RPM to red 2k RPM. 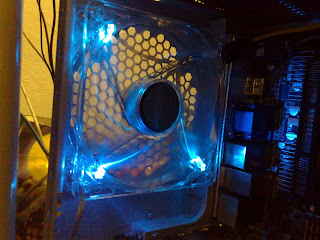 The old Cooler Master 1.2k blue LED fan has been placed at the 5.25" bay. 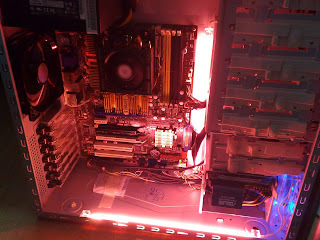 Hot enough? Doesn't it looks like a mini 'oven' to you? Not much different as before, just rearranged the bottom part of the cables and finalised everything before flying back to Miri. 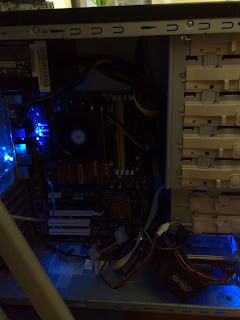 Ohya, added a pair of Corsair XMS2 1066Mhz 2Gb RAM too, now 6Gb RAM in total, yeay! These surgeries has cost me about RM300 in total, ouch, my pocket money just flew like that. 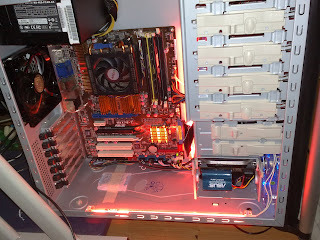 Originally, my theme was to get purple colour by combining both red and blue, but in the end, I only managed to get a little bit of purple at the 5.25" bay. Within 2 weeks, I've sneaked to Low Yat Plaza roughly 5 times, just to survey and grab the relevant accessories. 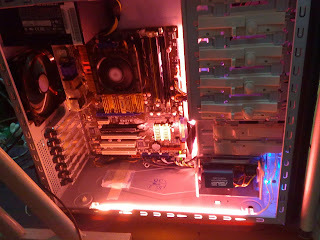 Perhaps next trip(November/December) will add some UV stuffs for my Desktop. By the way, just wait for 22nd November, I will fly back to KL, flight has been booked! *P/s: Sorry for not updating my blog recently, being a lazy axx lately.